Mint Canyon (Sierra Highway corridor) in present-day Canyon Country or Agua Dulce, 1950s-1960s. "Plastichrome" postcard by Colorpicture Publishers Inc. of Boston, No. P30335. Colorpicture started in 1938 with linen postcards and began publishing photochromes under the Plastichrome brand name in the 1950s. It went out of business in 1969. A postcard such as this would have been sold to tourists at the Solemint Store in the 1950s or Dillenbeck Market in the 1960s. 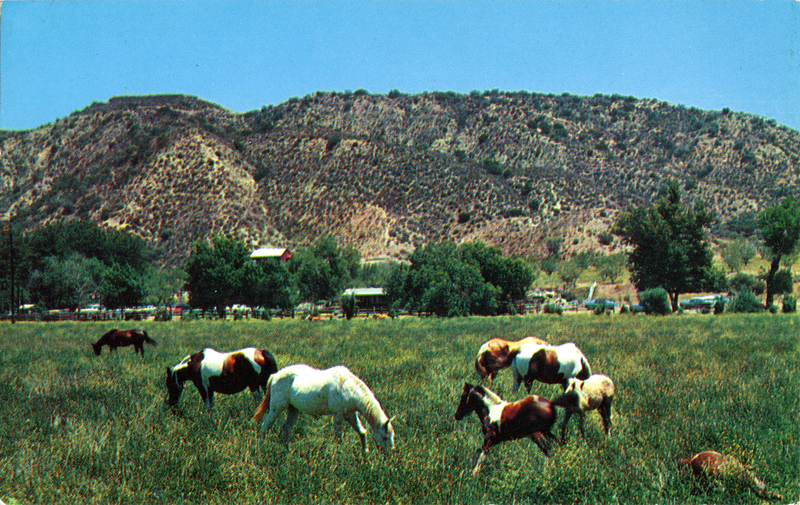 The name "Canyon Country" was invented in 1963 (by Art Evans) and became official in 1968 with the establishment of the Canyon Country Post Office. Previously it was considered part of Saugus. LW2592: 19200 dpi jpeg from original postcard purchased 2014 by Leon Worden.